The smell of fresh coffee, the sounds of St. Patty's weekend, and the shine of the early morning sun permeated as 13 members of faculty and the student body participated in SAPAC's winter semester Ally Training. Many wonderful members of SAPAC and the wider University community volunteered their time and facilitated multiple workshops throughout the day. 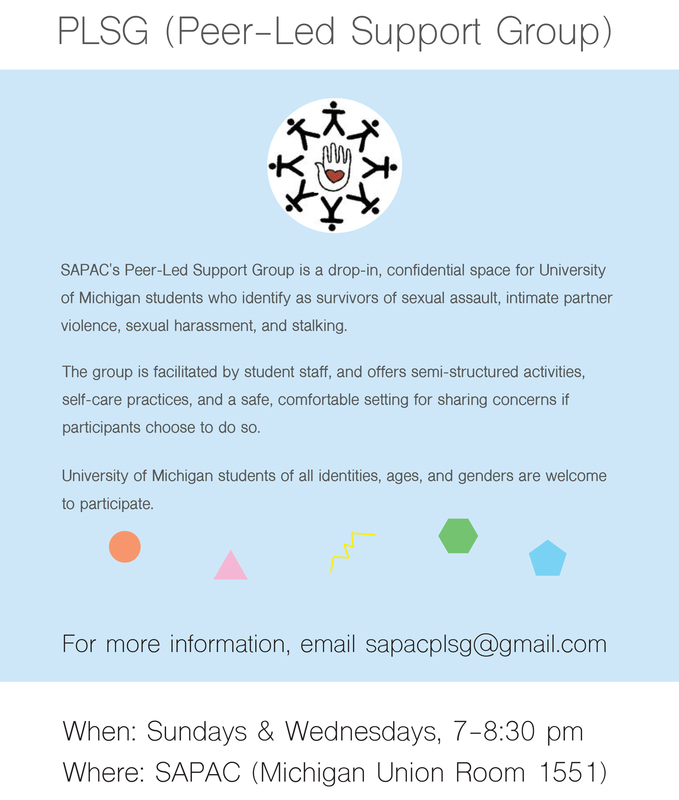 It has been an exciting semester for SAPAC’s Peer Led Support Group (PLSG), a confidential, peer-facilitated community that provides a space for student survivors of sexual violence to discuss concerns and practice self-care. PLSG meets twice a week, on Sunday and Wednesday evenings from 7-8:30. At meetings, we begin by encouraging participants to discuss their weekly “highs” and “lows,” what they have done outside of meetings for self care, and any other concerns that they are interested in bringing to the group. The University of Michigan's Student Sexual Misconduct Policy was replaced with a revised policy that is designed to be more clear and efficient while continuing to ensure that all students are treated fairly throughout the process. The new policy is titled University of Michigan Policy and Procedures on Student Sexual and Gender-based Misconduct and other forms of Interpersonal Violence.